There’s a lot here to discuss and a lot to absorb so I’m going to imply issue these Snippets as they occur to me and in no particular order. #Blumenthal: the guy who lied about being a soldier in Vietnam is questioning Kavanaugh’s ethics. #Going after judge Kavanaugh’s kids? Welcome ladies and gentlemen to today’s Democrat Party. every time you think they couldn’t possibly sink any lower, they say “hold my beer”. #The ultimate setup was the Parkland shooting victim father claiming that Cavanaugh turned away from him. He was doing so because he was instructed by security to do so. That’s on video. these facts are not going to stop the Democrats from trying to use this to paint him as the next Hitler. # The kind of arguments being offered by the Democrats are nonsensical in the extreme. Cory Booker for example, is claiming that the hearing is being rushed. The fact of the matter is, it’s taking longer to go through this process with this nominee then it has with any recent US Supreme Court nominee. Similarly, the Democrats complain about the lack of documentation. The fact of the matter is, there has been more documentation provided on Kavanaugh and then from any other US Supreme Court nominee recently… Indeed, the half-million documents submitted in support of the Cavanaugh nomination are more than were submitted for the last five U. S. Supreme Court nominations, combined. These ridiculous tactics are intended to delay as long as possible, hoping to wrench control of the situation away from the GOP… If not now, in 2018. # Every single one of these Democrat idiots on the committee, and most of the Democrats in Congress, have already announced that they’re going to vote against Kavanaugh, on party line, regardless of what gets done or said. So, this isn’t at all about fact. Rather, this is Kabuki theater intended to generate Democrat votes by reinforcing the Looney left base. #Sasse made some fairly decent points at the opening statements of the hearing, but the rest of his activities seem to be intended to mollify the GOP establishment, not the GOP voter. That’s a guy I’m going to have my eye on in the future… A somewhat jaundiced eye at that. #When people like Sassse, and heaven save us, Lindsey Graham, are both able and inclined to dismantle Democrat arguments on these matters as effectively as they have been, I think we can take that as a measure of just how far off the deep end the Democrats have gone. #However the most effective speaker was Ted Cruz. ( I still insist we would have been far better off with him leaving the show from 1600 Pennsylvania. ) He pointed out during his remarks that because the 2016 presidential election was held with an open US Supreme Court seat, and because the appointment of Supreme Court judges was high on the list of topics in the debates during that election cycle, there is kind of a super legitimacy for Cavanaugh’s nomination. Cavanaugh is precisely the kind of Supreme Court judge that Donald Trump promised as a candidate. In other words, precisely the kind of Judge that the American people wanted. It’s hard to conclude anything but that such Supreme Court nominations are precisely why Donald Trump was elected. #We can thank heaven that John McCain is not involved in this process. Out of spite and nothing else, he would be voting no against judge Kavanaugh, and his arguments would be equally nonsensical with the Democrats. # Not a bit of this would be happening if the federal government was in its proper role. The founders never envisioned the federal government affecting the daily lives of Americans. the growth of government to that degree is the fault of the establishment of both parties as I have said here repeatedly. # The Democrats have been operating on the far side of the edge of the world for so long that nobody’s paying attention anymore. They have cried wolf for far too long for anybody to care anymore. In other words, Democrats, welcome to the world that you’ve created. the only people who are going to be swayed by their arguments during this hearing are going to be the people that would have been voting for them anyway, and who in the end having a clue as to what the issues really are. #At the end of all of this, and as President Obama is famous for having said, elections have consequences. 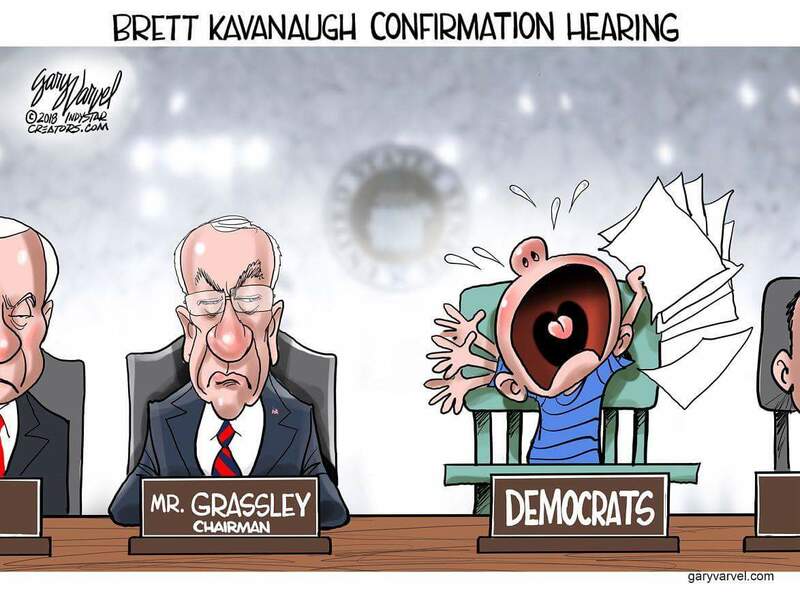 The childlike temper tantrums coming from the Democrats are both predictable and futile. The Cavanaugh nomination will be approved, and judge Cavanaugh will be Justice Cavanaugh. # Final thought. Is this really what democracy looks like? Or does it look to you as it looks to me, the brownshirts of the left, trying to shut down a deliberative process?